Welcome to VoIPDistri – your Voice over IP distributor. 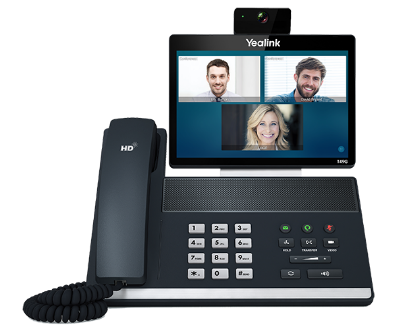 Yealink, the global leading unified communication (UC) terminal solution provider, has once again innovated in desktop communication with the introduction of the company’s flagship phone model, the SIP VP-T49G HD touch screen video phone. Designed for in-demand executives and teleworkers alike, the T49G contains Yealink’s latest telephony innovations and strikes the perfect balance between simplicity and sophistication, representing an ideal endpoint choice for desktop video collaboration. The T49G boasts an eight-inch LCD touch screen and an advanced HD front camera that supports 1080p resolution. Yealink partners with world-renowned audio solutions suppliers to deliver a truly cutting-edge voice solution with Optima HD voice, 360-degree pickup and full duplex. The model supports up to five mixed audio and video conferencing extensions and is compatible with video conferencing equipment offered by today’s mainstream vendors. The new model has a built-in Wi-Fi connection as well as Bluetooth functionality for hands-free use and phonebook synchronization with users’ smartphones. The phone can be connected to a monitor or laptop for a richer video experience through its HDMI connection. The built-in USB2.0 port offers multiple benefits such as local HD call recording and screenshot functionality via a USB flash drive. The Control Center and Notification Center functions offer one-button access to frequently used functions, streamlining and accelerating day-to-day use. Moreover, the full keyboard and intelligent search support simplify user input. For more information about Yealink SIP VP-T49G, visit the landing page on Yealink’s website.